Didn't sleep much at night! I think I slept only around 3am? A wide range of breakfast available there! Coffee, Tea, Water or Orange Juice? They had prata too. But the curry taste a lil different. The main thing for this trip - FX Micropay launch! Resorts World Genting launched a multi-currency pricing solution on its ‘iHoliday’ online reservation system, developed using FXmicropayTM, the Royal Bank of Scotland’s (RBS) innovative e-commerce foreign exchange management solution. Through RBS’s FXmicropay, Resorts World Genting will receive direct FX rates which are linked to the ‘iHoliday’ online reservation system, allowing customers to conduct instant multi-currency pricing and ultimately charging the same amount. Lots of yummy food at Ritz Carlton! Bloggers had this opportunity to try out the system! Now it's so easy to book a hotel in Genting! But anyways that shopping mall only has higher end brands. Dorothy Perkins, Topshop, Espirit, M.A.C, Forever21. It's like a Takashimaya or ION. Only grandma and sis bought stuffs there. I didn't. I realized one thing. Shopping in Msia can really help me save money. Cause when I see price tag, it's like RM$150 for a dress! Sounds so ex right, then I won't buy. But actually only SG$60 hahas. It's a campaign for malaysian women! I'm not malaysian, didn't know what it was about at first. They give me, then I just take LOL. A nice campaign to brighten up any women's day! Next, we were supposed to go to One Utama, board our coach and go back to SG. But there was some traffic jam issues and the coach will only reach at 6pm instead of 4pm. It's a super super huge shopping mall! We only reached back at around 11pm or 12mn! All I remember was that I fell asleep on the coach, when I woke up, it was all dark. And we were still far from home hahahahas. I survived on Wifi while I was in genting! Anyways, as bloggers, we were searching for wifi wherever we went to hahas! Need to instagram and tweet! Note that it might be a lil hard to find wifi when in Genting. 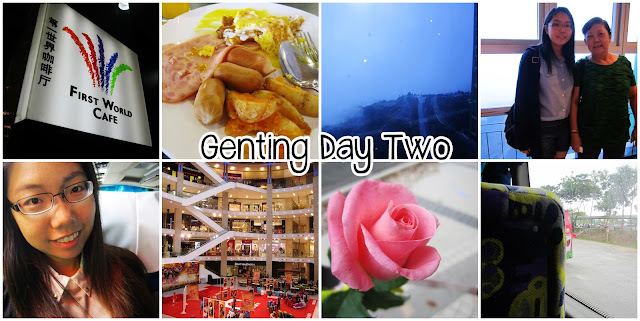 That's all for my 2D1N Genting trip!